Canadian Q2 GDP grew by 0.8% (annual rate of 3.1%), after expanding by just 0.2% in Q1, Statistics Canada reported on Friday. It was the biggest quarterly gain since Q3 2011. In June, on a monthly basis, the economy expanded by 0.3%. The second-quarter result was much stronger than the 2.5% growth central bankers had predicted last month. Both Canada and the United States suffered one of the worst winter conditions in modern history, which produced depressing first quarter results. Second quarter growth in the US was an impressive 4.2%. According to Statistics Canada, GDP growth was due to greater economic activity across all sectors of the economy apart from non-profit institutions serving households. After a flat Q1, final domestic demand increased by 0.7% in Q2, which was mainly driven by a 0.9% increase in household final consumption expenditure – within this component, outlays on goods rose by 1.2% and services by 0.7%. Business gross fixed capital formation posted a rise of 0.8% after two quarters of decline. Investment in homes increased by 2.9% and made the largest positive contribution to the overall gain. Ownership transfer costs, which had declined for two quarters, increased by 9% in Q2. While businesses accumulated $14.5 billion in inventories in Q1, in Q2 the figure fell to $7 billion. In the retail trade, spending on inventories of non-durable goods declined by $2.8 billion. 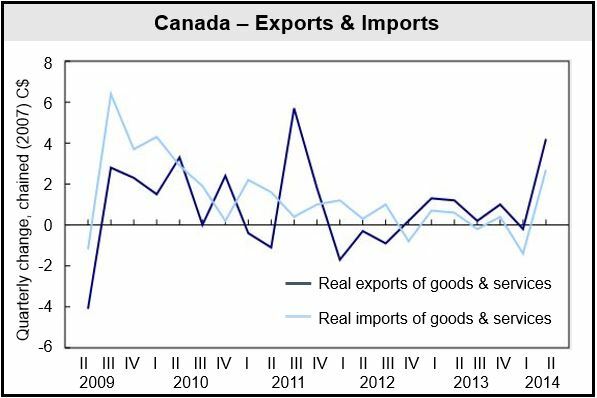 After declining by -0.2% in Q1, exports of goods and services rose by 4.2% in Q2, or 17.8% on an annualized basis. Goods exports increased by 4.4%. Goods and services imports posted a 2.7% rise. The Bank of Canada resets its policy stance next week. Despite stronger-than-expected growth in Q2, most analysts believe there will be no change in the benchmark interest rate, which has been idling at 1% for four years, until 2015. 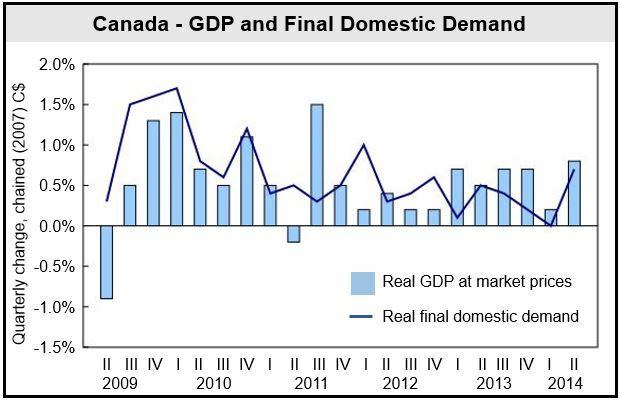 Closer inspection of the Statistics Canada report shows the economy is by no means solid yet. Economists comment that the central bank has several reasons to extend the current period of ultra-low borrowing costs. Governor Stephen Poloz says Canada’s households are tapped out after accumulating too much debt, meaning any future GDP growth needs to come from business investment and exports. Business investment, however, is sluggish even though companies are cash-rich.